The Mayan were and are not only excellent astronomers, mathematicians and architects, but have also gathered a rich treasure of indigenous knowledge on healing throughout several thousands of years. The heart of the Mayan culture is the famous calendar, which is based on the exact observation of the movements of moon, sun, Venus and other celestial bodies. Also, the anamnesis or diagnosis is built upon the traditional sacred moon calendar. The Mayan male and female healers are therefore also called Ajq´ij or the “carriers of time”. 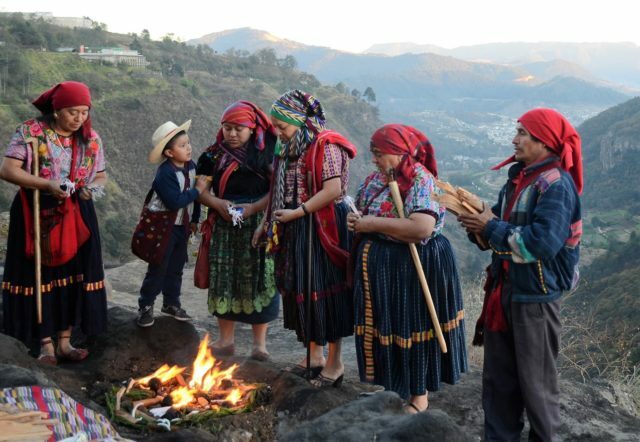 Depending on their individual healing gift (called don) given to them by the sacred power of Ahaw, there are different specialties – such as the spirit callers, traditional mid-wives, Ajq´omonelo r “carriers of time”, bone healers, political leaders – K´amalbé, the smokers – ahumadores, healers for children – Ajk´ulunell and the specialists in herbal medicine – the curander@s .
The collective of traditional healers Asindi Rex We, has now (with the financial support of my firm ender & Diversity Consulting) edited a book on the topic of the traditional world view and healing of the Mayan people. It will be published in Spring 2018 in Spanisch under the title „Vigencia y Aplicación de la Cosmovision Maya“ ; and in German as „Das Jahrtausende alte Wissen der Maya: Gültigkeit und Anwendung – geschrieben von den traditionellen Maya Heiler_innen Guatemals )Mam, Achí, Poqomchí, Kekchí und Kiché)“ . Presentations are forseen in Vienna and Guatemala. 24th of May, 6 p.m.: Seminarhotel Krainerhütte, Helenental 41, 2531 Heiligenkreuz.